A boy with terminal cancer from Iowa put out a call for racing stickers so he could use them to line his casket. A luxury car dealership in Fort Lauderdale heard the boy's call and decided to upgrade his request to a ride in an actual Ferrari. 11-year-old Caleb Hammond was diagnosed with leukemia in February 2017 and was told recently that his treatment wasn't working. Caleb and his family have decided to enjoy the time he has left outside of the hospital. "I believe he made the right choice to live it out, doing what we’re doing instead of laying in a hospital bed," his father said. 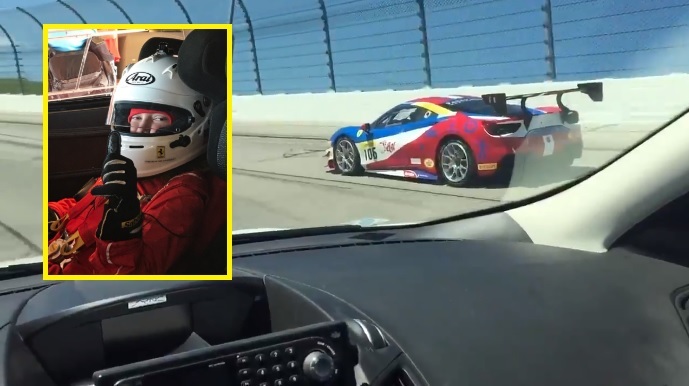 The story of the boy asking for racing stickers went viral and eventually reached Garrett Hayim, the owner of a Ferrari dealership in Fort Lauderdale, Florida. Hayim decided to give Caleb a chance to feel what it is like to be in a real race car. The dealership sent a Ferrari, a driver, and a racing suit all the way from South Florida to the Iowa Speedway. Hayim's own father is a cancer survivor and was touched by Caleb's story. "Maybe I can pull off shipping the race teams, the whole team," Hayim said. "The truck, the trailer, the race cars, the drivers, ship them all to Iowa and see if we could give this guy a day to remember." Driver Jody Coenen drove Caleb around the track starting at a slow pace but eventually reaching speeds of 202 miles per hour. David Hyatt, president of the Iowa Speedway said, "We are just happy to provide the venue where he can come and do this and happy to have them here. For us, it’s kind of a thrill watching him smile." tear jerker for sure.. i'm sad about the young man's prognosis and heartened by mr hayim's generous offer… god bless and pray for a miracle! Wow, its like a make a wish foundation come true but by a private party, what a nice thing to do!